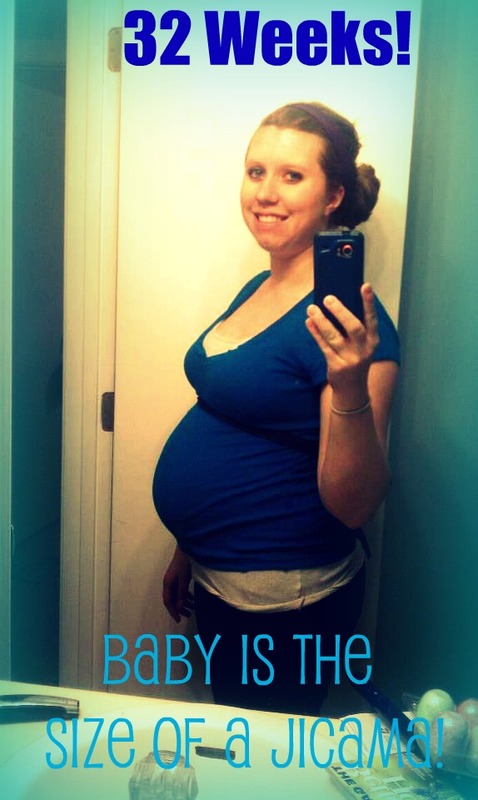 *Please note, this post was originally published on my former blog “Here Comes Baby One” on March 24, 2012. I’m republishing this content on this website to have it all in one place. Hope you enjoy digging up memory lane with me! How far along? 32 Weeks! So close!! Sleep: Still having crazy dreams! and I feel like I fall asleep the second I get home from work! Miss Anything? having friends and not being so hungry ALL the time no matter how much I eat! Movement: a lot of flips and turns and getting caught in my ribs/underwire of my bra. I had to go out and buy a bra without underwire because it got so bad. Food cravings: fruit pretty much is the only thing. Gender: Boy 🙂 FOR SURE. Symptoms: constantly hungry, tired all the time, heartburn, leg cramps, swelling, braxton hicks contractions and horrible, horrible migraines! Belly Button in or out? I think it might stay in, the top is just a little odd shaped like it might start to push. Happy or Moody most of the time: depends on the day and how much food/sleep I’ve had! Looking forward to: Our baby shower! !